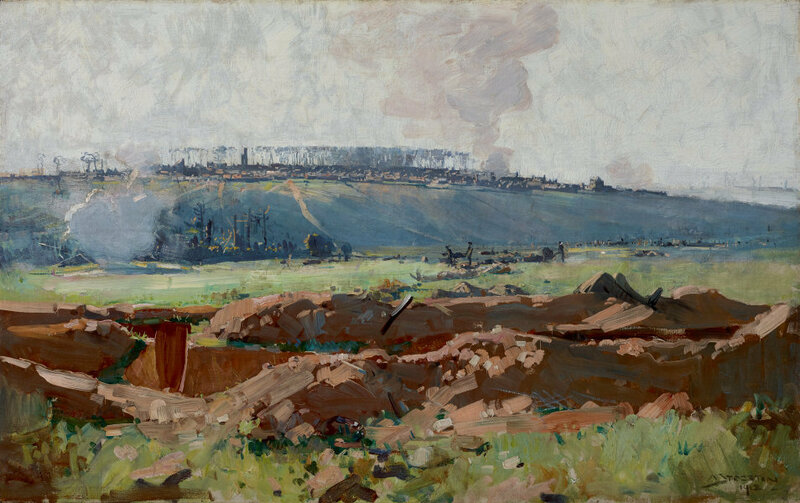 The Somme Valley that Arthur Streeton toured in 1918 was still raw with the wounds of major battles. One of the places he visited was the town of Villers-Bretonneux, which on 25 April (Anzac Day) 1918 had been recaptured by Australian soldiers at the cost of over 1200 lives. In 'Villers-Bretonneux', Streeton portrays an eerily quiet moment on the Western Front. It is a broad vista marked by conflict: the earth rent apart by artillery explosions, rows of trenches scored into the countryside and clouds of smoke billowing across the sky. In the distance, figures can be seen bearing stretchers. Signed and dated l.r. corner, black oil "A STREETON/ 1918".